Ahem...sorry about that... I am entering this card for Simon Says Stamp shabby chic challenge this week, the camera doesn't pick it up that well but the paper is distressed - honest!! Nikki this is fantastic he will love it! I love the balloon orange and coloured to perfection too! Thanks for the link to that tutorial I learnt sooooo much!! 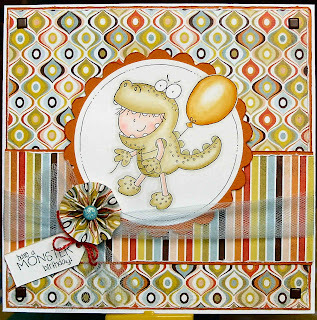 What a fabulous fun card ! Just love the image you have used and those fabby papers. Hello Nikki please head on over to Inspirational Card Sketches ASAP (as soon as possible). We have something waiting for you.